Why host a Paintball Birthday party? There are many reasons! Because Splatball is an indoor facility, you can host a paintball party year round without having to worry about what the weather is doing! Our indoor arena is 10,000 square feet and climate controlled for maximum comfort, even when getting covered in paint! No need to worry about stains either, all of the paint used at Splatball washes out with just soap and water. Nobody knows more about paintball in Minnesota. We’re the oldest paintball field in the state. There is no minimum number of players required. Splatball can accommodate nearly any sized group! Paintball is a safe and fun activity for kids of nearly any age. Each game will have a referee making sure that rules are being followed and teaching the party-goers how to play the game. Admission to the park includes private use of playing field, your own ref, all day admission, and all day Co2 refills. With all day to play your birthday party is guaranteed to be talked about for ages. We’re Minnesota’s paintball party experts! Give one of our party specialists a call at 612-378-0385 to learn more about birthday parties at Splatball. 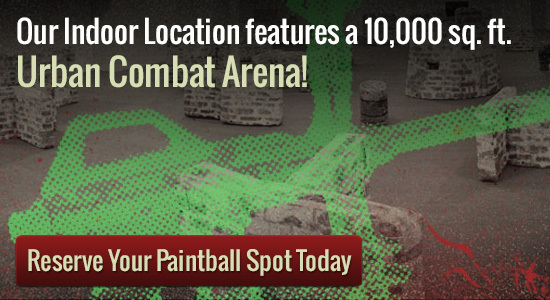 Don’t forget to mention that you are hosting a paintball birthday party to be eligible for the free rental upgrade! So what are you waiting for? Book your child’s next birthday party today! Click here for more info on reservations.